Knee pain can be caused by a number of different possible reasons. Whatever the reason is, exercise and maintaining a healthy diet can reduce it. 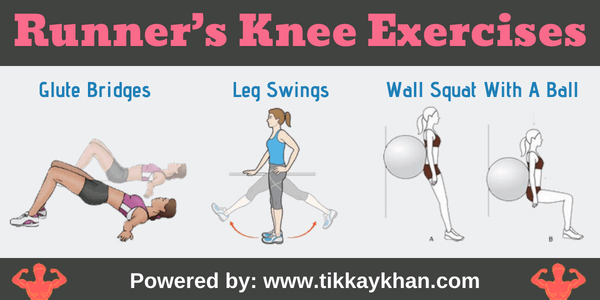 The very best knee exercises are the ones you can do at home or even during a break from work. They are easy and effective, and there is no need for any special equipment. Do them slowly and increase the number of repetitions as you feel comfortable and your muscles get stronger. After that, make sure to do a few stretching exercises to help your muscles. Don’t be too hard on yourself and consider knee exercises physical therapy every other day. 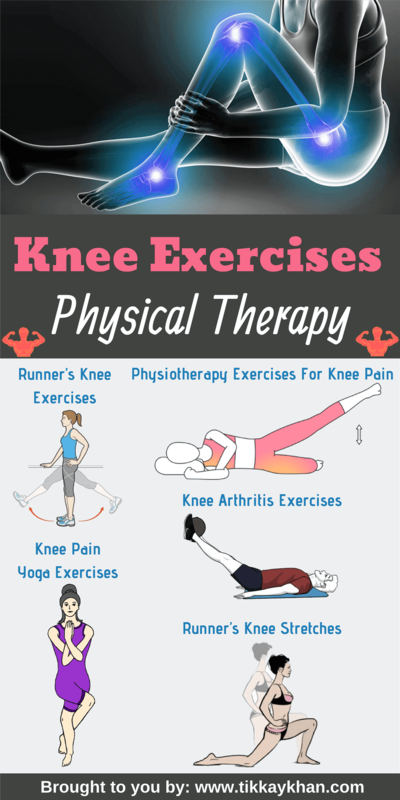 Knee exercises physical therapy are effective for men and women both. Any activity that mostly focuses on the knee joint can cause the runner’s knee but the common cause is running. According to the Harvard Medical School, runner’s knee is more common in women than in men, particularly in women of middle age. Overweight individuals are especially prone to the disorder. But there are different runner’s knee exercises to prevent this disorder. Lie on your back with bent knees, arms at your sides and feet flat on the mat, your feet should be about hip-width apart. Lift your backside off the ground until you make a straight line starting from your shoulders to your knees. Push your heels into the ground, and squeeze your glutes in order to stabilize your whole body as you lift your hips as high as you can. Hold for two seconds, return to the mat and repeat. Start with leg swings by standing next to a wall for maintaining the balance, and swing your right leg out in front of your body and then behind your body. Keep your leg straight and avoid swinging too much, you need to stay comfortable. Repeat and switch the legs. Similar to forward leg swings, simply swing the right leg toward the left, sweeping your foot across the front or your body and then back to the right. Repeat leg swings in each direction on each leg. Stand with your back, shoulders, and head against a wall. Look straight ahead. Keep your shoulders relaxed and your feet 3 feet from the wall and shoulder’s width apart. Place a soccer or basketball-sized ball behind your back. Keeping your back against the wall, slowly squat down to a 45-degree angle. Your thighs will not yet be parallel to the floor. Hold this position for 10 seconds and then slowly slide back up the wall. Repeat the number of times you want. Research shows that knee pain exercises after an injury keep your joints from swelling and provide the support you need to make movement easier and reducing the pain. 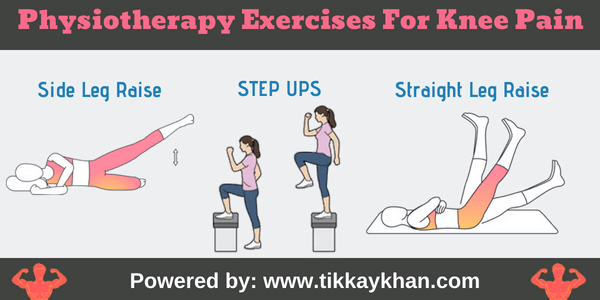 Physiotherapy exercises for knee pain will help you strengthen your knees and get back to doing the things you want. For the standing side leg raise, stand next to a sturdy chair and hold it for support. Transfer your weight to your left leg, stand tall and then lift your right leg out to the side and keep it straight as much as possible. Return to the starting position slowly. Hold for a second, then lower the leg, then repeat the exercise with your other leg. You can also perform this exercise while lying on your side. Start lying on your left side, with your body in a straight line from head to toe and your right hip directly above your left hip. Take your right leg and lift it toward the ceiling and then return to the starting position. After doing your desired number of repetitions, perform the exercise with your left leg. Before you start, find a step, chair, or bench that when you place your foot on it, your knee bends to a 90-degree angle. Stand in front of stairs, and hold onto something for balance. To start, place your right foot onto the step or chair. Tighten your right thigh muscle and step up, touching your left foot onto the step, bringing your left foot to meet your left so you are standing on the chair or step. Return to the starting position by stepping down with the right foot, then the left so both feet are on the floor. Complete 15 steps leading with the left foot, then repeat another 15 steps leading with your left foot. Do three sets. This pose build muscle strength to help support weak joints. Lie on the floor, keep upper body supported by your elbows. Bend your left knee to a 90-degree angle, foot on the floor. Keep the right leg straight, toes pointed up. Tighten your thigh muscles by contracting your quadriceps and raise your right leg. Hold for 3 seconds. Keep your thigh muscles tight and then slowly lower your leg to the ground. Touch and raise again. Repeat it with another leg. Yoga is something that can help you relax anytime you want. It is also a great way of reducing knee pain if you can do it with the right instructions. There are several yoga exercises for knee pain. Step right foot forward with toes pointing straight left toes turned 90 degrees to the side, arms out and palms facing up. Bend right knee in a lunge. Place back of the left hand on the left leg and arch back, reaching right arm overhead and toward the back wall, gazing toward the ceiling. Start standing with your toe touching and feet together. Engage your lower abdominal and pull your fingers towards your toes. Open up your chest and take deep, full breaths. Now bring all of your focus to your feet and work on spreading through the toes and pressing them into the floor evenly. Make sure your weight is centered in the arch of the foot and imagine lifting up from the inner arch, through the ankle up through the knees. Engage your muscles and lift them up above the kneecaps. Bend your knees if you feel that you are locking them. In a standing position, bend the knees and wrap the right leg over the left, balancing only on the left foot. Wrap thighs tightly on top of each other with no space in between. You can wrap your arms the same way (right over left), or simplify with hands in prayer position. If thighs cannot make full contact, leaving some space is OK, but make sure the effort is still toward wrapping one thigh over the other. If you have trouble balancing, use a wall or chair for support. Start standing in Mountain Pose, and then open to the side on your mat one leg’s length apart. Turn your right toes forward ninety degrees and your left toes in about seventy-five degrees. Hinge to the right over your leg and place your hand on your ankle, shin, upper thigh, or a yoga block. Imagine you are between two narrow walls and bring your body back into space with your hips. Actively engage the legs and draw up the kneecaps and inner thigh muscles. Hold five to eight breaths then switch sides. Bring the knees together to the floor, the hips between your ankles and the feet hip-width apart. Carefully sit on your heels and let your heels touch the outside of your hips. Rest the hands on the knees with your hands facing up or down. Press the lower legs into the floor and reach the top of the head up to lengthen the spine. Drop the shoulders and press the chest towards the front. Put your tongue up to rest on the roof of the mouth, just behind your front teeth. Breathe deeply through your nose. Hold as long as you feel comfortable. Exercising can relieve arthritis pain and other symptoms, such as stiffness. It maintains the joint’s range of motion and strengthens the muscles that support the joint. 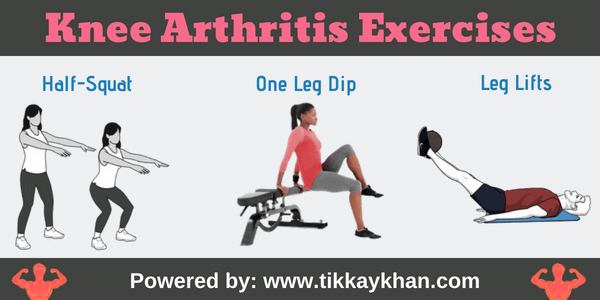 Knee arthritis exercise minimizes stress on the joint as they increase its flexibility and strength. Stand on your feet with some distance apart and stretch your arms out in front of you. Slowly bend your knees until you are almost in a sitting position. If required, hold on to a chair for balance. Keep your back straight and chest up doesn’t move forward. With your feet flat on the mat, hold the position for 4 seconds, then slowly stand back up. Repeat the whole process again and again. Take two chairs and place yourself between them, Stand there and hold on to the chairs for balance. Lift the right leg up and hold it out in front of you. Slowly, keeping yourself straight, bend the left leg and lower your body a bit, pretending that you are going to sit in a chair. Don’t cross the right leg in front of the left leg. Hold for 3 to 5 seconds and straighten back up. Repeat it with the other leg. Stand against a wall and raise one of your legs to the side and make sure that you are not rotating your toe to the side, keep your toe facing forward or slightly in. Avoid moving forward to the stationary side, put your leg down. Repeat with another leg. If you tend to experience knee pain or discomfort, do the following runner’s knee stretches every single day, hold each for a couple of seconds or as much as you can. Stand up straight or lie down when you are ready to stretch your hamstring. Bend one of your legs and put your hands under your leg just above the knee, take your right leg, bend and pull it closer to you gently. Stay like this for 20 to 25 seconds. Reverse your legs and repeat with the other leg. Knees bend help strengthen the muscle around the knee for support Stand against a wall with your feet away from you and your knees slightly apart from each other. Place a ball between your back and the wall for a better performance. Keep your feet pointing outwards. Bend your knees slowly and slide your back. Try to apply pressure on your buttocks as you come up. Repeat a few times. Stand on the edge of a step and place one of your foot on the ground, keeping a bit of your other foot on the step. Allow the heel to drop below the step and hold it for 20 seconds, then exchange sides. You can also place both feet on the step, or a calf machine and drop both heels at the same time. Just be sure to hold on to something in front of you if you choose this. Lift one of your foot off the floor and slide it forward so that your knee is on the ground next to your hand, and your foot is near your other hand. It depends on your flexibility, where your knee and toes fall. Slide your right leg back, keep your foot far from yourself and lower yourself to the floor and onto your elbows, bringing your upper body down as far as possible. Hold the stretch without letting your upper body fall. Once you feel like you’ve got a good stretch, change the side. Too much rest can weaken your muscles, which can worsen joint pain. Do not practice exercises if you are currently experiencing headaches, insomnia, low blood pressure, or if you are light-headed. Always work within your own range of limits. 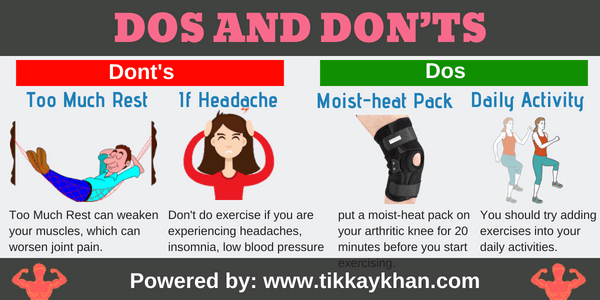 If you can, put a moist-heat pack on your arthritic knee for 20 minutes before you start exercising. Heat is soothing and it also brings the blood to the surface, decreases stiffness, and sometimes relieves pain. As you get used to the exercises and discover which ones work best for you, you should probably try adding them into your daily activities. Mild discomfort during exercise is normal. So is being a little bit sore the day after exercise. But if you experience severe pain, swelling, or stiffness, stop exercising and see your doctor.